What is stylish, fancy, fascinating, but also mocked sometimes? The fascinator, of course! In this blogpost, I’m going to tell you the story of this headdress and tell you, what you should keep in mind when wearing one. Before diving deeper into the story of the fascinator, we are going to examine what this term actually describes. A fascinator is a style of millinery, a headpiece. In contrast to hats, which are usually at least partly made to protect the wearer from the sun or cold, fascinators don’t really have a utilily. They are just meant to be decorative. It is also related to small cocktail hats. Originally, fascinators were a form of lightweight knitted head-covering. By now, we use the term to describe an alternative to the hat, which usually has large decorative designs attached to a band or clip. Headgear that combines the features of a hat and a fascinator can also be described as a hatinator. To understand the story of the fascinator, it is worth to have a look at the story of hats and headdresses in general. Since thousands of years and in many different cultures, some kinds of headdresses or hair accessories are known. Often, the headdress also showed the status in society of the wearer. Although hats were worn before, Queen Marie Antoinette can be seen as the inventor of the fascinator. She wore ostrich feather, for example, as a head deocration, but her most extraordinary headdress was definitely her huge hairstyle with a sailing boat on top. Her extravagant lifestyle lead to a lot of criticism. After her death, more subtle head decorations came into fashion for some time. Until the middle of the 20th century, almost every woman wore some kind of headcovering; this was what social ettiquette required. At the beginning of the 20th century, hats were huge and well decorated with feathers, flowers, and so on. The rule: The more decorated the hat, the higher the statuts in society of the wearer. Coco Chanel was the first one who offered very simple hats without any frills at around 1910. While in the 1920s, the cloche became en vouge, and Schiaparelli already created very surreal and sculptural hats in the 1930s, surprisingly, the 1940s were the decade were hats got very extravagant. 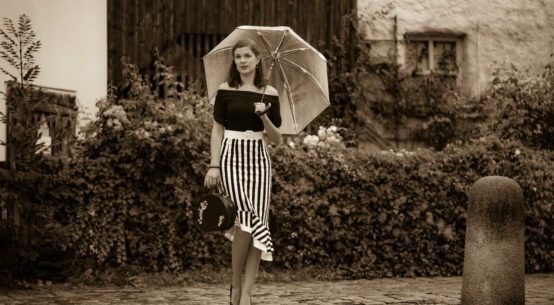 During World War II, fashion didn’t really change and was quite simple and plain. The rationing of many materials led to a shortage of new clothes, so a lot of old garments were simply reworked. However, materials like feathers, veils, or flower decorations usually weren’t rationed. So women tried to make their outfits more fashionable by decorating their hats. Especially some of the French women wore such decorative headdresses during German occupation that this was seen as a kind of resistance, known as”les chapaux de la Résistance“. But although some women wore such decorative, extravagant hats, the social pressure to wear hats fell victim to the war. Suitable head coverings, sometimes made of cloths were often worn, and even inspired the hat fashion after the war. During the formal 1950s, milliners created a lot of different hat styles: very chic and small cocktailhats, strawhats, berets, as well as very oversized hats that looked a lot like the hats and fascinators which are now worn to the horse racing at Royal Ascot. Around 1968, hats came a least partly out of fashion, and they definitely weren’t an essential part of an outfit any longer. Especially here in Germany, the fascinator got really popular in April 2011, when various female guests arrived wearing fascinators at the wedding of Prince William and Catherine Middleton. The controversial fascinator style hat designed by Philip Treacy and worn by Princess Beatrice of York, the so-called “pretzel hat”, attracted probably most of the attention. Nevertheless, fascinators or fascinator style hats are, at least in the UK, still worn by (some?) women as a Christian headcovering during church services, especially (royal) weddings, or to popular horse races. In Germany, women usually don’t wear hats or fascinators to weddings, so I would love to know: is it true that fascinators are frequently worn to “normal” weddings in the UK? Or is it just a myth that refers to the popular royal weddings? A popular millinier who designs fascinators and fascinator style hats is Philip Treacy. His creations are not only worn by the royals, but also by style icons like Dita von Teese and Sarah Jessica Parker. A fascinator is definitely an eye-catcher and almost always looks a bit over the top, if you are not attending a royal wedding, of course. So if you decide to wear such a headdress, you need courage. A striking, sculptural fascinator is suitable for formal occasions. Depending on the dresscode, fascinators are also great for weddings. But be careful: Too fancy fascinators might look like a cry for attention. A fashion event is another suitable occasion for a fascinator. Small fascinators that fit closley to the hat and resemble a cocktail hat are suitable for a variety of informal events. Garden parties, dance, or evening events are just some examples. A fascinator attracts all the attention to the head, so make sure your hair looks good! You can either style your hair into a chignon or bun, or you wear your hair down. However, your hair should always look styled. A so-called “undone” hairstyle isn’t really suitable for this kind of headdress. For a harmonious look, I recommend to match the colour and style of your fascinator to your outfit (or the other way round). Furthermore, I suggest to choose reserved colours like black, navy blue, cream, or rosé, for example. 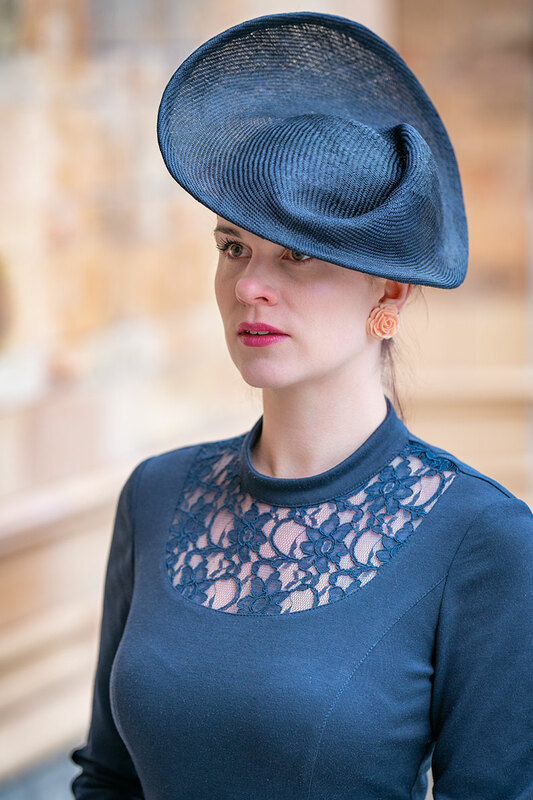 I teamed my fascinator made by Nicki Marquardt, a milliner from Munich, with a perfectly matching dress by Atelier Belle Couture*, which I already showed you here. A light pink handbag by Furla as well as rose earrings by Glitter Paradise finish this outfit. To keep my legs warm, I chose the Gennia Glamour stockings* by Secrets in Lace. They don’t have a seam, which makes them quite sublte. Therefore, they don’t steal the show from my fascinator. As always, the quality of those Secrets in Lace stockings is amazing and they feel absolutely great on the skin. 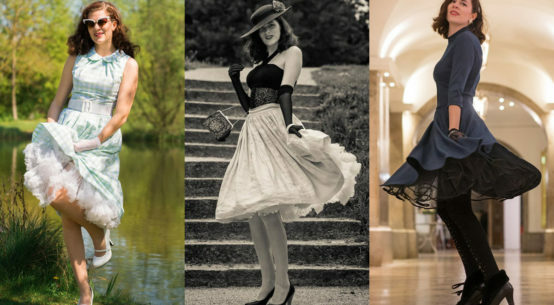 PS: If you would like to know when seamless stockings came into fashion, I recommend this blogpost.